With the separation from Serbia in 2006, Montenegro inherited trained and disciplined in-place ground and naval forces. Their goal is to transform these units into a NATO-compatible force consisting of a light infantry brigade, a helicopter-based air force and a navy capable of coastal patrolling, search and rescue (SAR), and counter-terror operations. Major equipment projects include the replacement of its JNA (Yugoslav Army) Soviet-era aircraft with modern helicopters, and the conversion of its existing blue water frigates to patrol craft. When the Minister of Defense spoke on the matter he said that Montenegro will retain only rotary aircraft in its inventory. Due to the small size of the country, helicopter equipped air arm would be dedicated to border patrol, internal security and SAR duties. A well-planned development of the sea and air surveillance, and of respective operational centers, will enhance the command andresource management capacities with a view of enhancing security and safety. Montenegro has a long history of aviation, in the cultivation of spirit and a pronounced love of aviation. The first balloon flight in the Balkans was carried out in Zagreb (then Austria-Hungary) 15 November 1789, and the pilot Krsto Madžarevic was from the Montenegro. Less than a decade after the Wright Brothers first flight, the inhabitants of the capital of Cetinje had the opportunity, the honor and privilege to be the first to observe this region the arrival of an aircraft Obilic meadow. It was September 5 1913. It was the Slovenian Italian origin who was King Nikola called 'buzz' and Obilic field in Cetinje became the first airport in Montenegro. Already in 1926 formed the first airline clubs. Pilots participating in Montenegro and the Balkan wars, the First and Second World War and many unselfishly laid their lives for the sake of the defense of their country. Aviation has a rich history and heritage that gives the greatest pride. The unit was formed at the end of the war in 1944 in Novi Sad as 111.lovacki Aviation Regiment, and after the war in 1949 as 172.lovacko bomber aviation regiment. By 1950, in addition to the basic tasks and perform specific tasks at night, the Air Force got the title of 'the people of Night'. Since 1965 starting with the specialist training of cadets and school and becoming the people within the Air Force Academy. The early 1970s and during the 1980's units perform flight training of cadets of foreign armies. During this period, not coincidentally given the title of undisputed record for 1970-1986 shows the continuity of the highest accolades in all exercises of combat readiness (the annual surge in that period was 300 hours per 11,000 hours pilot and the yearly rush of units). During 1993 a helicopter squadron was formed, a regiment in 1994, the brigade contained a helicopter regiment. In those years, this unit was the largest aviation unit in the Balkans (4 Aviation, 2 helicopter squadron and acro-group, a total of 7 squadrons). During the 2005 reform of the SMAF the 172.abr was dissolved and transformed into 423.Vazduhoplovnu base when downsized and logistical elements of previous 423.Vb. This is the first unit in the Air Force which operated under the new model, which gave the possibility that after the referendum in Montenegro and the formation of the Army of Montenegro without any difficulty practically continuously proceed with the execution of basic tasks. The 172 Aviation Brigade at Podgorica included the bulk of the advanced jet trainers (i.e. G-4 Super Galeb) that formed the basis of the new Montenegran Air Force now that Montenegro is an independent. 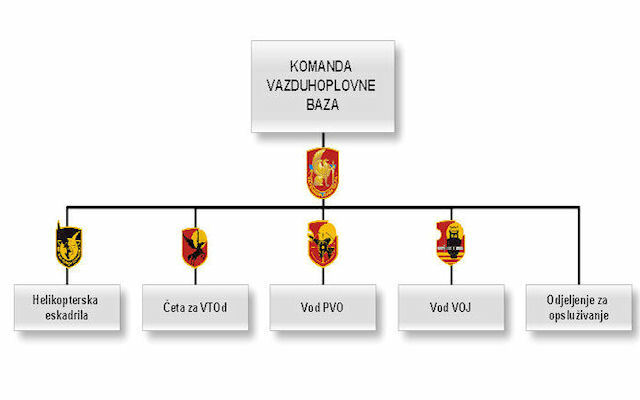 The bulk of the air forces of Montenegro and Serb Republic were transferred to Serbia. About 70-80 aircraft in total, mostly Gazellas, Galeb G-4s and J-22's, with some Mi-8 as well. According to one report 5 or 6 G-4s were transferred to Serbian Air Force, while 7 G-4s that were not airworthy were sold to a private entity in Croatia and were supposedly being overhauled in Slovenia. The G-4's at Golubovci AB were supposed to be transferred to Serbian AF but that process was delayed. Montenegro will completely lose its fixed wing aircraft capability as soon as remaining G-4s are sold or transferred. As of Septembe 2011 a total of 13 G-4 aircraft were in surplus. All surplus had been disposed of, while one unit has 7 planes (3 G-4 and 4 UTVA), as operational reserve and their future status will be resolved in line with the definition of the air space surveillance and protection issues. The Helicopter squadron at Golubovci operating Gazelles consists of 1st Helicopter Flight, 2nd Helicopter Flight, and 3rd Helicopter Flight. Each of the three helicopter flights has a specific task consisting of close air support, transport and utility duties.